Syncro Safari's 20th Anniversary Event!! 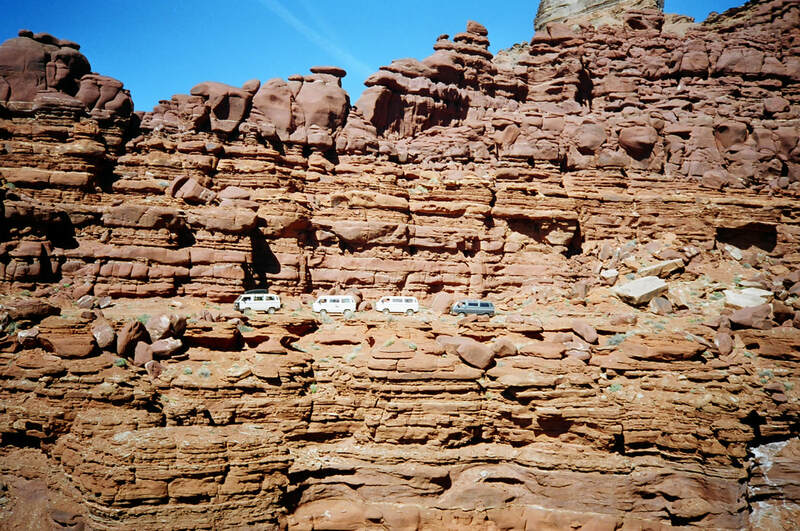 The first Syncro Safari was held in Moab in 1998 and commemorated by the 10th anniversary event in 2008! The 2018 Syncro Safari adventure was held in and around the four-wheeling "Mecca" that is Moab, Utah. The event included 4-wheeling, a Colorado River jet boat tour, dinosaur tracks, cliffs, arches, canyons, history, hiking, dancing, and more! Breaking from the typical Syncro Safari limit of 10 Syncros, this adventure was expanded to include 20 Syncros! We got to see old friends and meet new ones. By the end of the week, people we met days before were more like family than strangers. On Friday, April 6, we took an adventure that included the Mill Canyon Dinosaur Tracks, Tusher Tunnel, Secret Spire and finished up going down Long Canyon. These sites along with a few others along the way (Courthouse Rock, Determination Towers and Tombstone Rock) were all visited in a single amazing day captured on video by fellow Syncronaut Ron Chandler. Thanks Ron for the great photography and drone video work! Who: 20 Syncros and about 35 Syncronauts. Why: Moab's 4-wheeling and scenery is world-renouned and a Syncro is a great way to experience it! Taco Night with Raffle. Horseback riding planned for some. Did you know? Moab has over a hundred 4x4 trails that are mapped and described in detail. ​More than any other single region in the USA. The region has a myriad of sights to discover with a landscape of contrasting colors, land forms and textures unlike any other in the world. Arches National Park alone has over 2,000 natural stone arches, in addition to hundreds of soaring pinnacles, massive fins and giant balanced rocks. This red-rock wonderland will amaze you with its formations, refresh you with its trails, and inspire you with its sunsets. ​Generous sponsors of Syncro Safari, Moab '18 - THANK YOU! GoWesty again sponsors Syncro SafariTM by providing generous goodie-bag give-away items each driver. Thanks GoWesty! Van-Cafe sponsors Syncro SafariTM by providing generous give-away items for our raffle. Thanks Van-Cafe! New: Rocky Mountain Westy is a first-time sponsor of Syncro SafariTM, providing generous give-away items for our raffle. Thanks Rocky Mountain Westy!